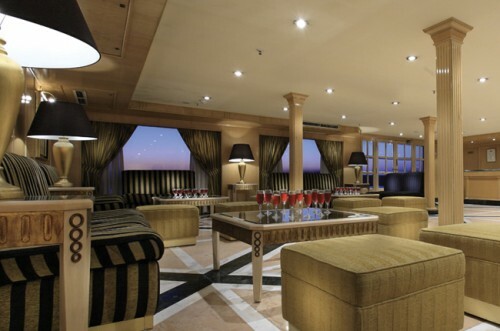 Iberotel Crown Emperor is a five-star deluxe river Nile cruise liner and the first one to receive the ISO14001:2004; the internationally recognized Environmental Management Standard Certification. The Iberotel Crown Emperor launched 2004 and renovated 2009 The Iberotel Crown Emperor provides a comfortable accommodation spread all over its massive 118 cabins. With sleek and elegant interiors set up in a blend of modern furnishings, you can choose whichever that suits you from 108 double cabins, 2 singles, and 8 suites with balconies. The upper deck (1) has 34 double cabins and 8 suites. The upper deck (2) has 30 double cabins. The main deck has 32 double cabins and 2 singles. The lower deck features 12 double cabins and the restaurant.